Today is a sad day for Brontë lovers worldwide, as we affectionately remember Charlotte Brontë, who died on this day in 1855 in particularly tragic circumstances – when she was looking forward to bringing a child into the world. 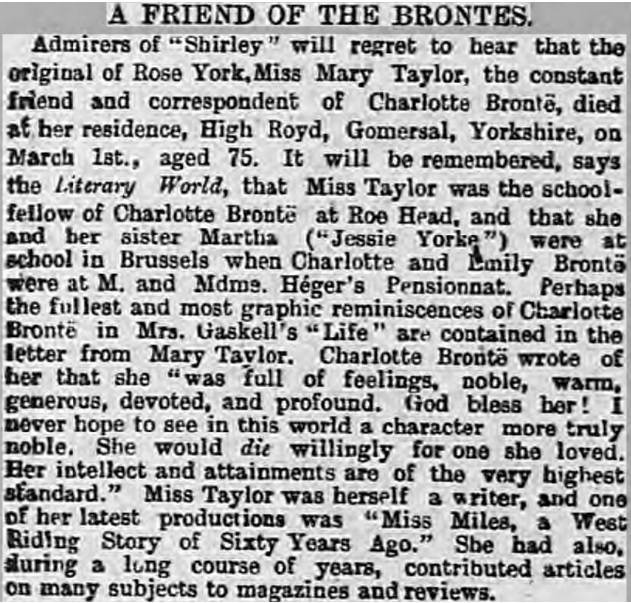 Tragedy, of course, appears all too frequently in the Brontë story, and in the stories of some of their most celebrated fans. 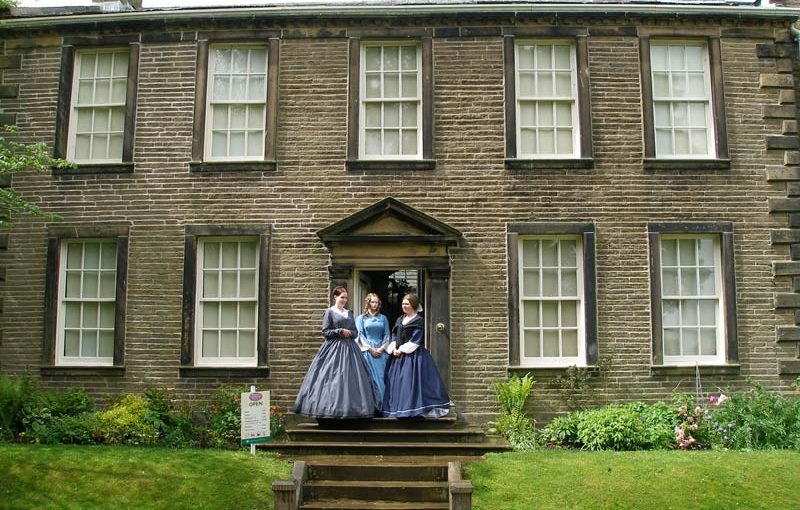 One of the sure signs of the brilliance of the writing of Anne Brontë and her sisters is that their legacy is an enduring, and still growing, one. They inspire readers across the globe to pick up their brilliant novels and poems, but throughout the years they’ve also inspired numerous writers of the very highest calibre. Sylvia Plath, for example, wrote a magnificent poem entitled ‘Wuthering Heights’ describing the spiritual feeling she gained from walking on Haworth’s moors. Born in Massachusetts, she is now buried in a churchyard in Heptonstall, just nine miles from Haworth. 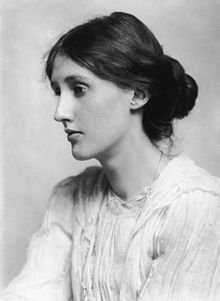 Sylvia was a giant of twentieth century poetry who left us too soon, and she shared a love of the Brontës with the woman we’re going to look at now: perhaps the greatest of all twentieth century writers, a genius who revolutionised the novel, and an equally tragic figure: Virginia Woolf. Virginia’s legacy was large and varied, but universally brilliant, and from Mrs. Ramsay of ‘To The Lighthouse’ to Clarissa Dalloway and the gender swapping, time defying, Orlando, she often takes a brilliant and powerful look at the role of women in society. 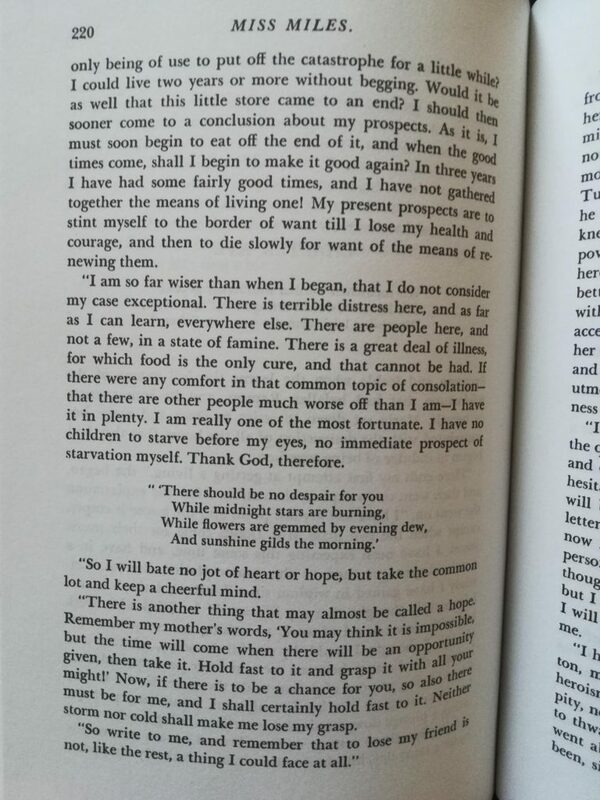 Perhaps this is one thing that she took from the Brontës. Virginia Woolf would also have been aware of the difficulties the Brontës initially had in finding a publisher, and how they had to pay to have their first books published. Virginia didn’t encounter this problem, but as she became more celebrated and more confident in her talents, she hated being censored and edited by her publishers. 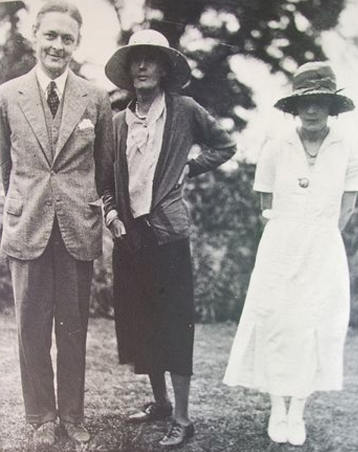 It was this that led her, with her husband Leonard Woolf, to found the Hogarth Press in 1917. Virginia Woolf could now publish her own books without having to see parts struck out by editors who hadn’t any of the genius that she had, but she also used it to publish works by some of the most important authors of the century, including the aforementioned Eliot, E.M. Forster and Laurens van der Post. “I do not know whether pilgrimages to the shrines of famous men ought not to be condemned as sentimental journeys. It is better to read Carlyle in your own study chair than to visit the sound-proof room and pore over the manuscripts at Chelsea. I should be inclined to set up an examination on Frederick the Great in place of an entrance fee; only, in that case, the house would soon have to be shut up. The curiosity is only legitimate when the house of a great writer or the country in which it is set adds something to our understanding of his books. 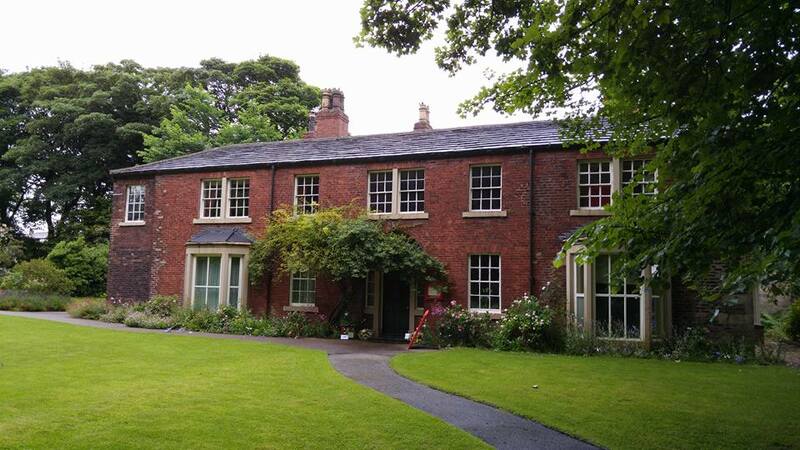 This justification you have for a pilgrimage to the home and country of Charlotte Brontë and her sisters. The Life, by Mrs Gaskell, gives you the impression that Haworth and the Brontës are somehow inextricably mixed. Haworth expresses the Brontës; the Brontës express Haworth; they fit like a snail to its shell. How far surroundings radically affect people’s minds, it is not for me to ask: superficially, the influence is great, but it is worth asking if the famous parsonage had been placed in a London slum, the dens of Whitechapel would not have had the same result as the lonely Yorkshire moors. However, I am taking away my only excuse for visiting Haworth. Unreasonable or not, one of the chief points of a recent visit to Yorkshire was that an expedition to Haworth could be accomplished. 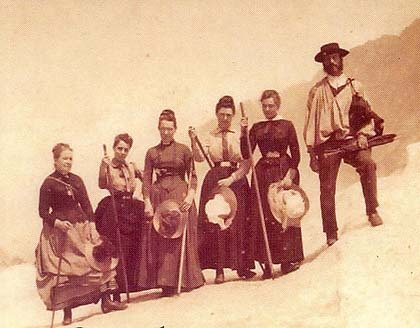 The necessary arrangements were made, and we determined to take advantage of the first day for our expedition. A real northern snowstorm had been doing the honours of the moors. It was rash to wait fine weather, and it was also cowardly. 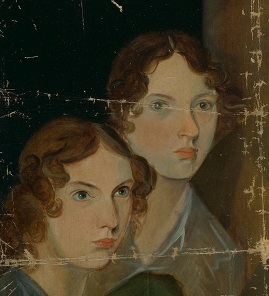 I understand that the sun very seldom shone on the Brontë family, and if we chose a really fine day we should have to make allowance for the fact that fifty years ago there were few fine days at Haworth, and that we were, therefore, for sake of comfort, rubbing out half the shadows on the picture. However, it would be interesting to see what impression Haworth could make upon the brilliant weather of Settle. We certainly passed through a very cheerful land, which might be likened to a vast wedding cake, of which the icing was slightly undulating; the earth was bridal in its virgin snow, which helped to suggest the comparison. 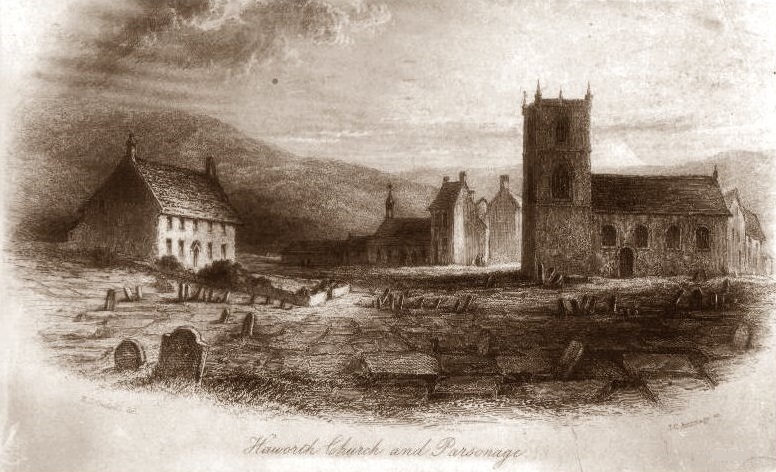 Keighley – pronounced Keethly – is often mentioned in the Life; it was the big town four miles from Haworth in which Charlotte walked to make her more important purchases – her wedding gown, perhaps, and the thin little cloth boots which we examined under glass in the Brontë Museum. It is a big manufacturing town, hard and stony, and clattering with business, in the way of these Northern towns. They make small provision for the sentimental traveller, and our only occupation was to picture the slight figure of Charlotte trotting along the streets in her thin mantle, hustled into the gutter by more burly passers-by. It was the Keighley of her day, and that was some comfort. Our excitement as we neared Haworth had in it an element of suspense that was really painful, as though we were to meet some long-separated friend, who might have changed in the interval – so clear an image of Haworth had we from print and picture. At a certain point we entered the valley, up both sides of which the village climbs, and right on the hill-top, looking down over its parish, we saw the famous oblong tower of the church. This marked the shrine at which we were to do homage. It may have been the effect of a sympathetic imagination, but I think that there were good reasons why Haworth did certainly strike one not exactly as gloomy, but, what is worse for artistic purposes, as dingy and commonplace. The houses, built of yellow-brown stone, date from the early nineteenth century. They climb the moor step by step in little detached strips, some distance apart, so that the town instead of making one compact blot on the landscape has contrived to get a whole stretch into its clutches. There is a long line of houses up the moor-side, which clusters round the church and parsonage with a little clump of trees. At the top the interest for a Brontë lover becomes suddenly intense. The church, the parsonage, the Brontë Museum, the school where Charlotte taught, and the Bull Inn where Branwell drank are all within a stone’s throw of each other. The museum is certainly rather a pallid and inanimate collection of objects. An effort ought to be made to keep things out of these mausoleums, but the choice often lies between them and destruction, so that we must be grateful for the care which has preserved much that is, under any circumstances, of deep interest. Here are many autograph letters, pencil drawings, and other documents. But the most touching case – so touching that one hardly feels reverent in one’s gaze – is that which contains the little personal relics of the dead woman. The natural fate of such things is to die before the body that wore them, and because these, trifling and transient though they are, have survived, Charlotte Brontë the woman comes to life, and one forgets the chiefly memorable fact that she was a great writer. Her shoes and her thin muslin dress have outlived her. One other object gives a thrill; the little oak stool which Emily carried with her on her solitary moorland tramps, and on which she sat, if not to write, as they say, to think what was probably better than her writing. The church, of course, save part of the tower, is renewed since Brontë days; but that remarkable churchyard remains. 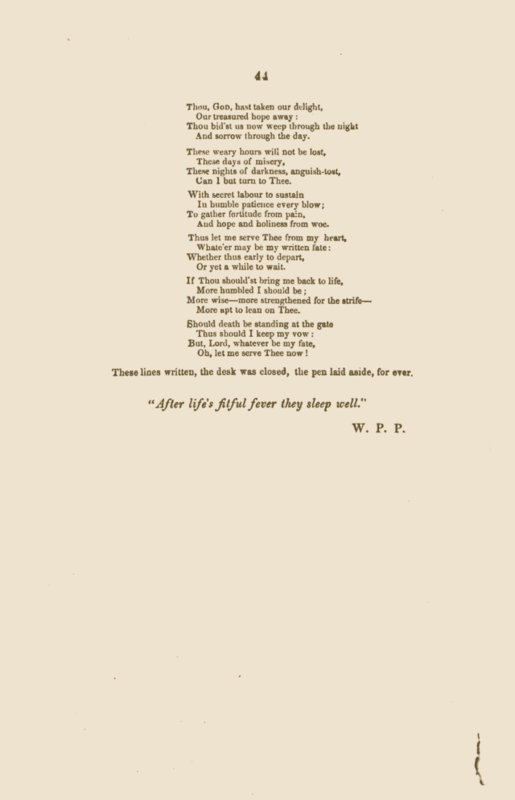 The old edition of the Life had on its title-page a little print which struck the keynote of the book; it seemed to be all graves – gravestones stood ranked all round; you walked on a pavement lettered with dead names; the graves had solemnly invaded the garden of the parsonage itself, which was as a little oasis of life in the midst of the dead. 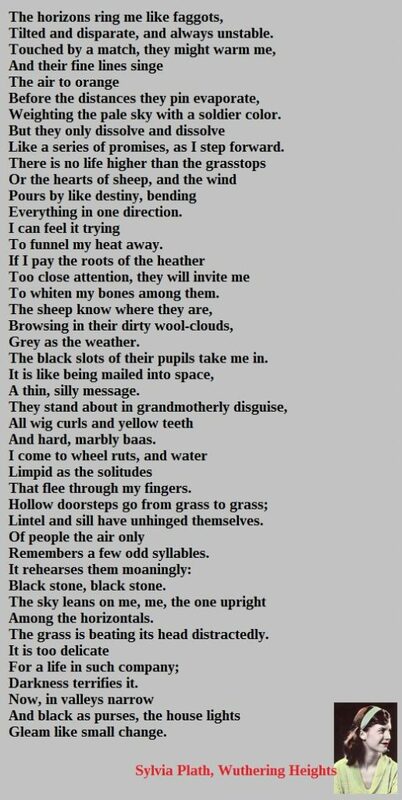 This is no exaggeration of the artist’s, as we found: the stones seem to start out of the ground at you in tall, upright lines, like and army of silent soldiers. there is no hand’s breadth untenanted; indeed, the economy of space is somewhat irreverent. 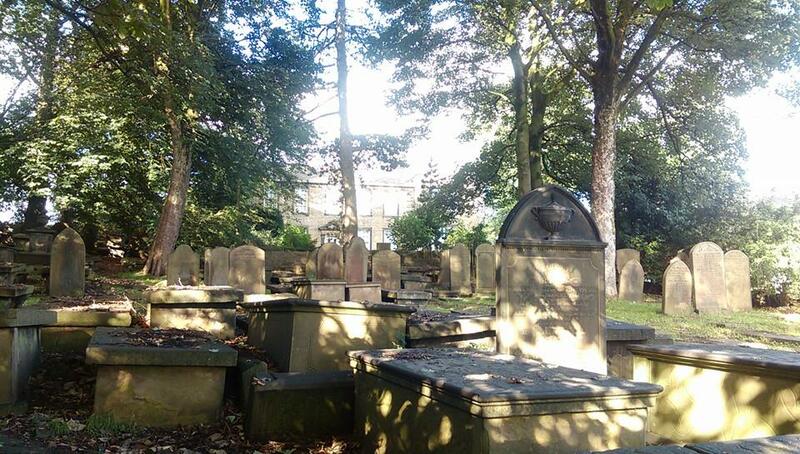 In old days a flagged path, which suggested the slabs of graves, led from the front door of the parsonage to the churchyard without interruption of wall or hedge; the garden was practically the graveyard too; the successors of the Brontës, however, wishing a little space between life and death, planted a hedge and several tall trees, which now cut off the parsonage garden completely. The house itself is precisely the same as it was in Charlotte’s day, save that one new wing has been added. It is easy to shut the eye to this, and then you have the square, boxlike parsonage, built of the ugly yellow-brown stone which they quarry from the moors behind, precisely as it was when Charlotte lived and died there. Inside, of course, the changes are many, though not such as to obscure the original shape of the rooms. There is nothing remarkable in a mid-Victorian parsonage, though tenanted by genius, and the only room which awakens curiosity is the kitchen, now used as an ante-room, in which the girls tramped as they conceived their work. One other spot has a certain grim interest – the oblong recess beside the staircase into which Emily drove her bulldog during the famous fight, and pinned him while she pommelled him. It is otherwise a little sparse parsonage, much like others of its kind. It was due to the courtesy of the present incumbent that we were allowed to inspect it; in his place I should often feel inclined to exorcise the three famous ghosts. 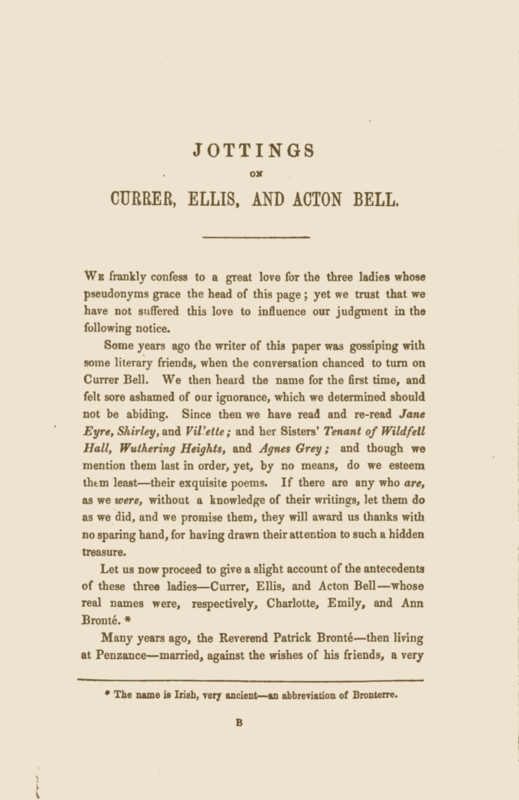 Posted on 24th March 2019 24th March 2019 Leave a comment on The First Brontë Biography: Jottings By W.P.P. 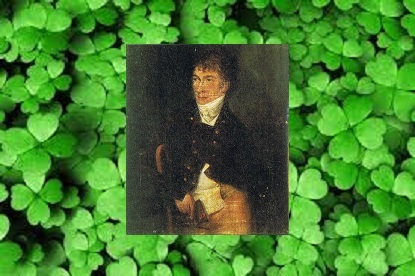 Happy St. Patrick’s Day to you all. 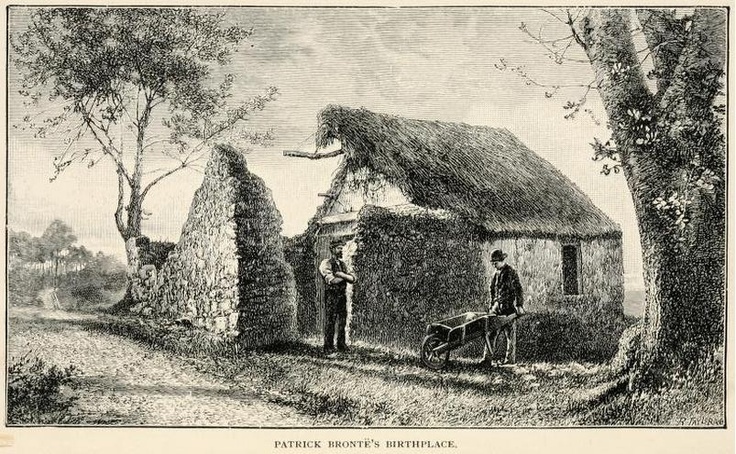 It has long been tradition in Ireland to name boys born on this day after the great snake scaring saint, and so it came to pass that on 17th March 1777 a baby born in Emdale, County Down was named Patrick. 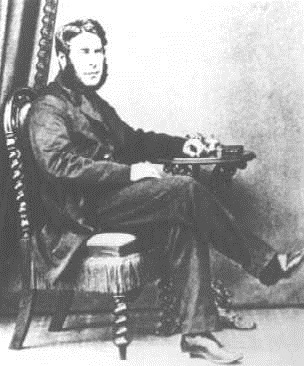 We would come to know him as Patrick Brontë, father of the greatest writing family the world has ever seen. In my opinion Patrick’s influence for the good on his children, and therefore on their later work, cannot be underestimated, so it’s good to see special tribute being paid to him in the Brontë Parsonage Museum this year. 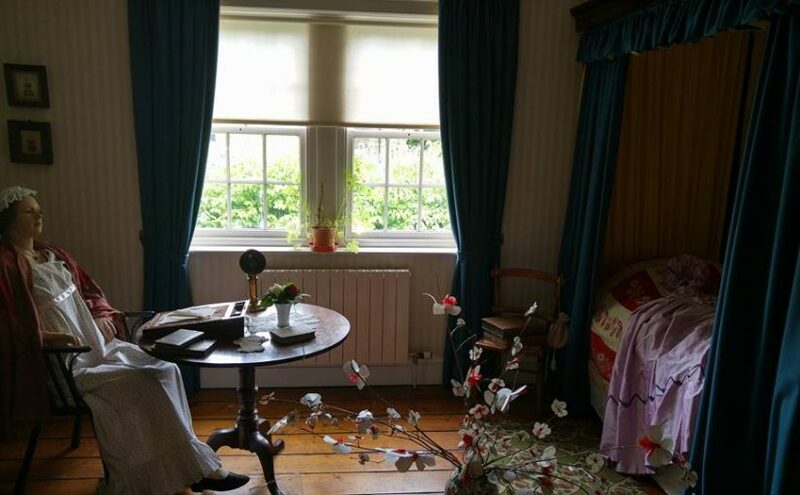 Thanks to reports contained within Elizabeth Gaskell’s biography of Charlotte Brontë (originating from the testimony of one former and short serving maid Martha Wright), however, some may still think of him as being strict, bad tempered or cold emotionally. 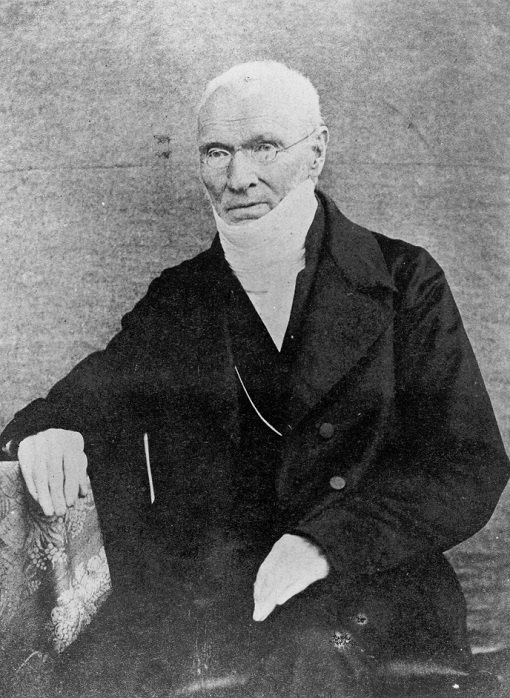 In today’s post, I’m simply going to let others speak about Patrick Brontë – those who knew him, and who saw a very different man to the one that Gaskell portrayed. I’m absolutely thrilled to announce that I will have a new book out in 2020. 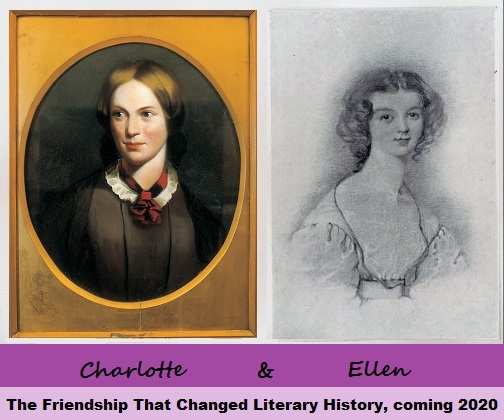 Provisionally titled ‘Charlotte & Ellen’ it will be published by The History Press, and it will look at the fascinating life of Ellen Nussey, and particularly at her friendship with Charlotte and the rest of the Brontës. Research is going well, and I’m looking forward to travelling to Birstall, Gomersal, Haworth and Hathersage in the next few weeks – I’ve already uncovered some fascinating facts about both Ellen and Charlotte that aren’t in any other book. 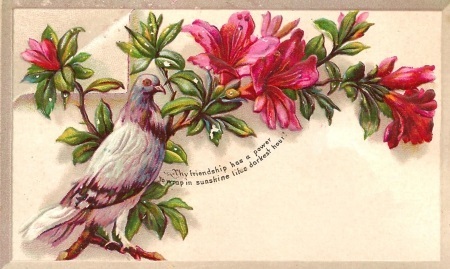 With this in mind, today is a great day to look at some famous literary friendships, from Johnson to Austen and from Brontë to, er, Brontë. Samuel Johnson is most famous as the Dr. Johnson who wrote his Dictionary of the English Language in 1755. It wasn’t the first dictionary, as is often thought, but it was certainly the most comprehensive at the time. Johnson spent seven years working on it (is it just me that thinks of Baldrick burning the dictionary in Blackadder at this point? ), but he wasn’t always such a methodical worker – he wrote his most celebrated novel ‘Raselas’ in just one week to raise money for his mother’s funeral. He also wrote plays, poetry, literary criticism, works of philosophy, religious sermons and travel books before his death aged 75 in 1784. In 1763 he met the 9th Laird of Auchinleck and instantly formed a strong friendship that would be instrumental to his work in the last two decades of his life. 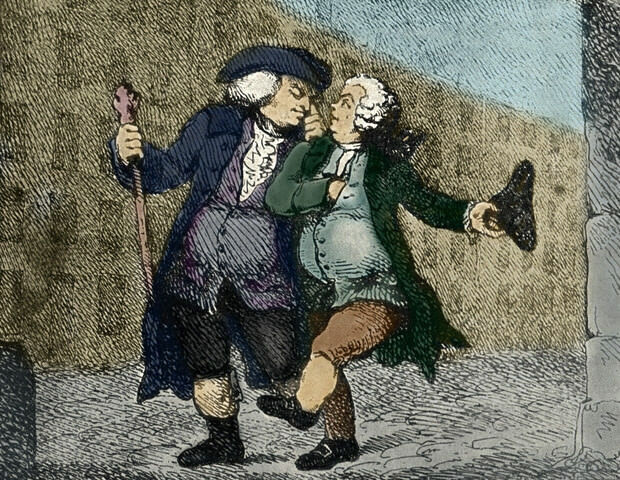 Auchinleck is better known as James Boswell, and his journey with Johnson a year later was the subject of the latter’s book ‘A Journey To The Western Islands Of Scotland’. 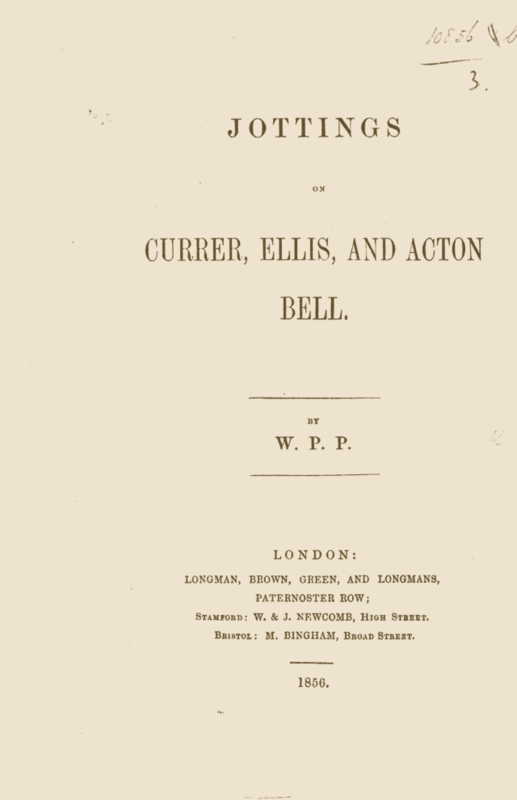 Boswell later wrote about his great friend in ‘The Life Of Samuel Johnson’, which many people have claimed is the greatest biography ever penned. In adult life Jane and Cassandra were equally inseparable, and from 1809 until Jane’s death in 1817 they lived together in a cottage on the beautiful Chawton estate which had been gifted to their brother Edward. Cassandra’s emotional support was always there, and it was this that helped Jane conquer setbacks in her personal and writing life, enabling her to claim a position as one of the world’s most loved creators of fiction. Anne and Emily fuelled each other’s creativity from their earliest days, creating their own fictional land of Gondal and later, fittingly, having their books ‘Wuthering Heights’ and ‘Agnes Grey’ published together. 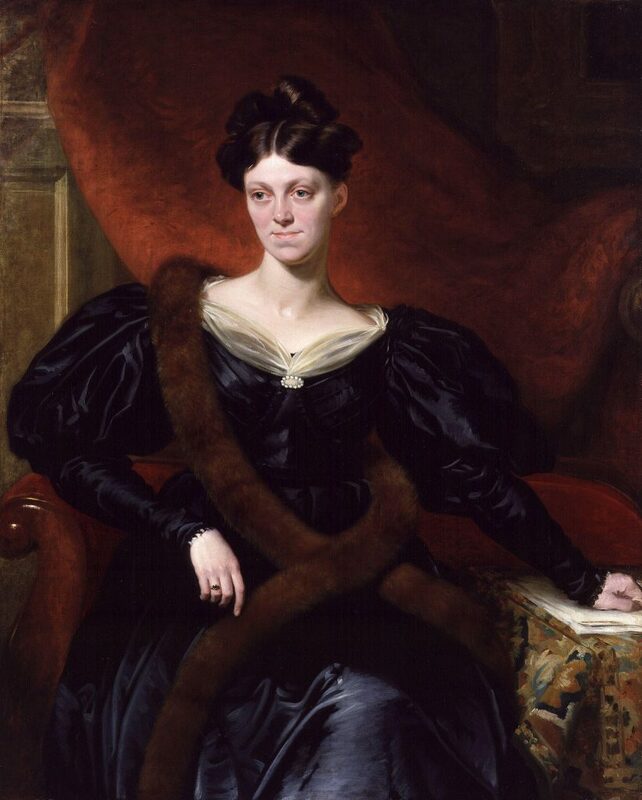 This has been a momentous week of anniversaries for Mary Taylor, for the 26th of February 1817 marked her birth, whilst the 1st of March 1893 saw her death. 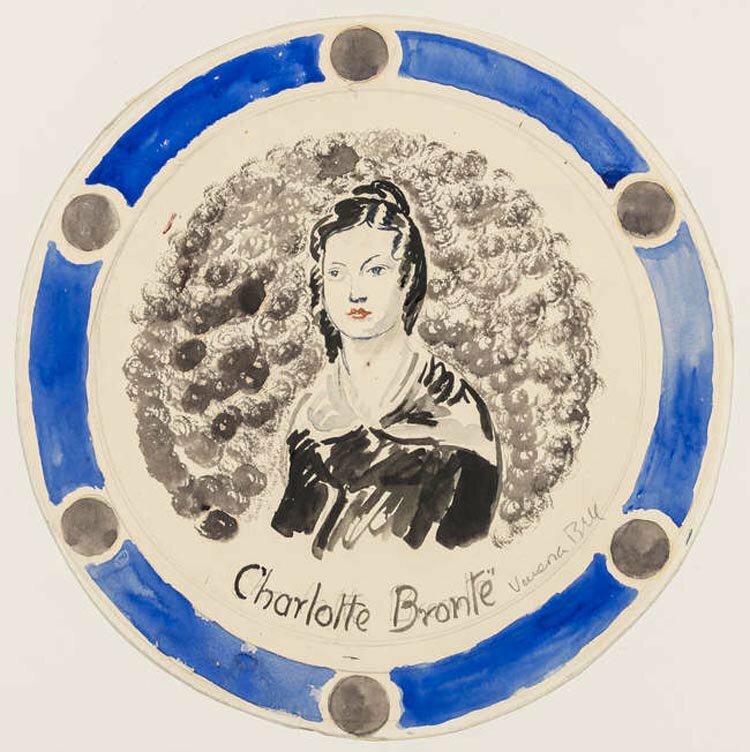 It was a long life for the times, and a very eventful one – she is most known today as one of the two great friends of Charlotte Brontë (along with Ellen Nussey), but she also became a businesswoman, a travel writer, an ardent feminist and a novelist in her own right. This, then, seems the perfect time to remember the real Mary Taylor. 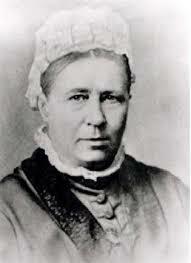 Mary was born in Gomersal in the West Riding of Yorkshire, and her family the Taylors were on the rise. They were heavily involved in the production of red cloth that was used in British military uniforms, and as the Napoleonic wars and subsequent conflicts raged, this proved to be very lucrative indeed. The family lived in the Red House, which was until recently a wonderful museum (that’s a picture from inside it at the head of this post), and they even operated their own bank there. In January 1831, Mary Taylor was sent to Roe Head School, recently opened in the nearby town of Mirfield. She found there a fellow pupil she already knew, from the neighbouring village of Birstall, and from a similar mercantile family: Ellen Nussey. These two soon formed a close bond with another pupil there who was from a very different background; this young woman was a year older than them, small, painfully shy and from a considerably less wealthy background – there was something about her, however, that grabbed your attention; even aged 15 it was obvious that here was a woman of truly unique character and talents, it was of course Charlotte Brontë. A far better analogy in my mind is that they were mining for diamonds in the dark, but this comment should not be taken as a slight on Mary’s part, who loved the sisters dearly, but rather the difference in their personalities. Mary was not a home lover, never content to simply sit and read, she was a woman who from an early age was in search of adventure. It was this that took her, in the company of her younger sister Martha, to Europe after the sudden death of her father in December 1840. It was found at this point that his wealth had been built on promises, and he left a series of debts behind him, but Mary and Martha still had enough to install them in the prestigious Chateau de Koekelberg finishing school in Brussels. Charlotte sent Mary ten pounds (worth well in excess of a thousand pounds in today’s money) to buy a cow, and in 1849 she founded her own business. 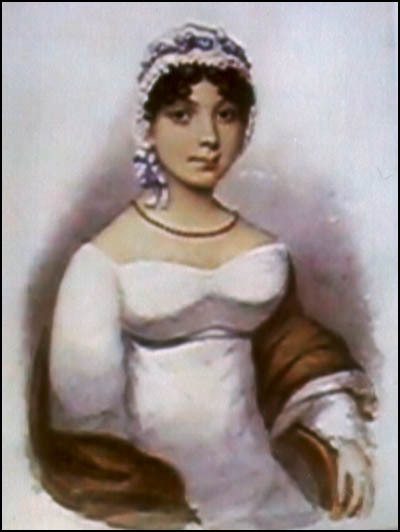 Mary’s cousin Ellen Taylor had by this time emigrated to Wellington too, and they founded a draper’s shop together that proved to be highly successful. 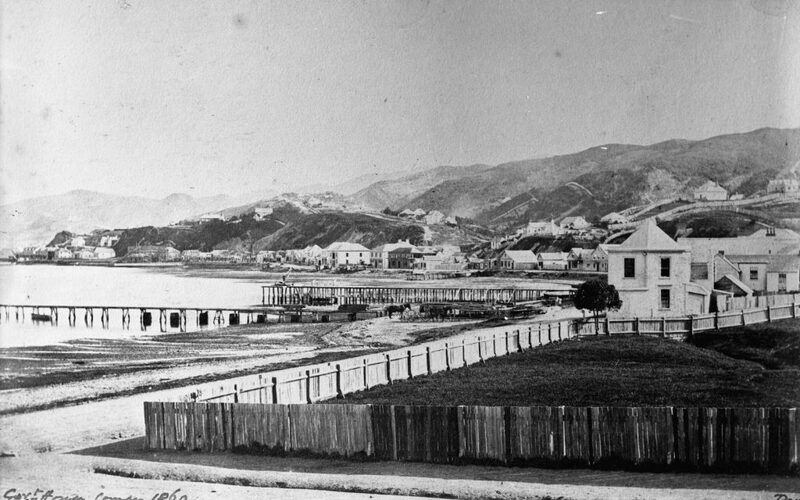 In 1851, however, Ellen Taylor died from tuberculosis, and towards the end of that decade Mary sold the business and returned to Gomersal, having first endured the terrible Wellington earthquake of 1855 that destroyed so much of the growing city. 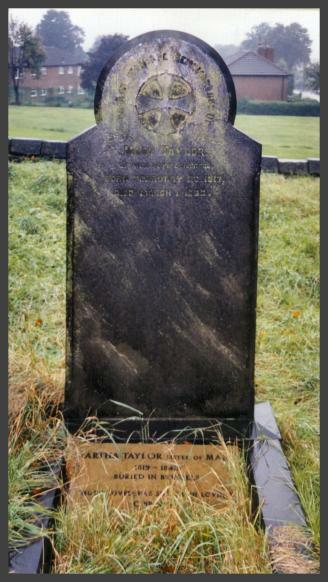 It was too late to see her old friend again however, as by the time Mary landed back on English soil in 1859, all of the Brontë siblings were dead. Mary returned to Gomersal a woman of independent wealth, and she lived in High Royd, a grand building owned by her brother Joseph. She travelled extensively across Europe again over the next few years, and took particular delight in Switzerland, where she often went climbing in the Alps. She ‘adopted’ a series of Swiss sisters who came to work as maids for her in Gomersal, and she also formed a close bond with a woman called Grace Hirst who many saw as a kind of daughter to her (although others thought their closeness was scandalous). Mary loved nothing more than being in female company, and became regarded as an eccentric, although one with a brilliant mind. In the 1860s she began to write journalism, and she was passionate about social inequality and particularly about the rights of women. It was this subject that formed the basis of a series of articles published by ‘Victoria Magazine’ between 1866 and 1877. Collected together as ‘The First Duty Of Women’ they place Mary as a Victorian pioneer of feminism. Even in later life, Mary Taylor showed no signs of slowing down. In 1890, at the age of 73, she had her own novel published: ‘Miss Miles, Or A Tale Of Yorkshire Life 60 Years Ago.’ It was not reviewed kindly, with many reviewers saying it was far too slow for contemporary tastes, but I think it’s well worth a read. 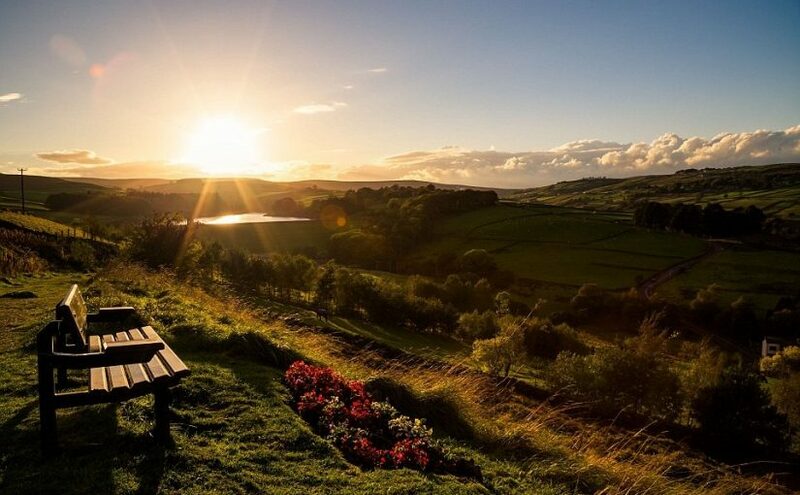 In common with ‘Wuthering Heights’ it has sections written in the Yorkshire dialect that may prove hard to read and understand for those outside the county; it also, however, has passages of beauty, light and wit, and it is very well written. Mary’s three key concerns in life are well represented here: the poor conditions in which the working class lived in, religious hyprocrisy, and the importance for women to make their own way in life, rather than submitting to the marital drudgery expected of them. In 1850, Mary had stated (in a letter to Charlotte Brontë) that she was ‘obstinately lazy’, but she certainly overcame this trait. In her life she supported with friendship one of the greatest writers of them all, she became an excellent scholar and taught in Germany and Belgium, she wrote brilliant articles, completed a novel and stood up for the downtrodden at every opportunity; she climbed mountains, and she knocked down barriers.